1. Boil the eggs in a pan of simmering water for 9 minutes, then drain and cool. Shell and halve the eggs. 2. Meanwhile, cook the potatoes in a pan of boiling water for 8–10 minutes until tender. Add the beans and cook for a further 3 minutes until both are tender. Drain and cool under running water then transfer to a serving platter. 3. Whisk the vinegar, mustard and honey together with a fork, then whisk in the oil until well blended. 4. 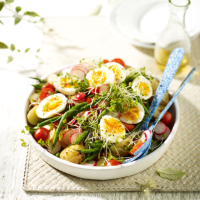 Arrange the tomatoes, radishes and eggs on top of the beans and potatoes. Drizzle over the mustard dressing and scatter with cress to serve. Cook’s tipA few capers or anchovies scattered over the top before serving would add a nice salty balance to the sweet dressing.